Graffiti artists to meet the cops the chased them throughout the last twenty years. 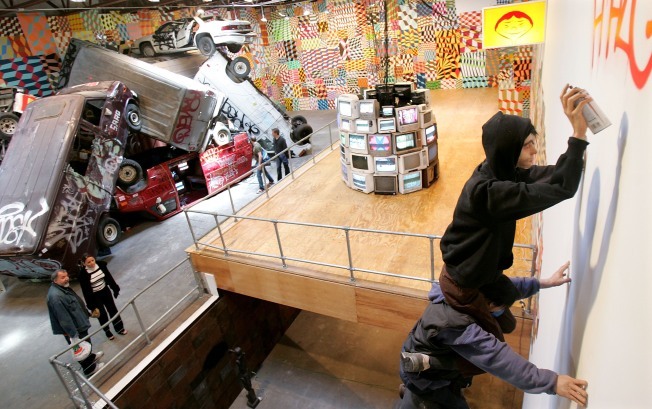 Graffiti artists from around the city plan to show up at Dumbo's powerHouse Arena to meet face-to-face with the man who chased them throughout the last 20 years. One of those men is Joseph Rivera, author of "Vandal Squad: Inside the New York City Transit Police Department, 1984–2004," a book which chronicles his time spent with the NYPD Vandal Squad. The planned "conversation" at the powerHouse Arena is happening because the city's street artists are upset at the former cop for "using their names and art to put money in his bank account," as the Brooklyn Paper puts it. The two parties are planning to meet and have a civil chat about the whole shibang. But what if some of the undercover practices that Rivera and his crew pioneered chasing subway vandals in the 80s, and may have netted the supposed "Poster Boy" a few months back at a SoHo art party, are in effect that night. Will the more notorious street artists even show up? It doesn't really matter, as the panelists include representatives for the community in graffiti legend COPE2, graffiti activist Ket, and street artist Ellis G. For the law's side, Vandal Squad author Joseph Rivera will be joined by former Commanding Officer Lieutenant Steven Mona and original Vandal Squad Lieutenant Ken Chiulli. Through e-mail, Sara Rosen, a representative for powerHouse, told me that she hasn't spoken with anyone at the police department, nor does she "have any involvement with current law enforcement officials." "That said," she added, "the Vandal Squad often comes out for graffiti events, so it is not out of the realm of possibility that they might send someone to the event." And for any artists hoping to scope things out on the down-low, she did confirm that "It has already been circulated among the graffiti community that anyone with a warrant should not attend the event, for concern about such a possibility." But Rivera, who retired when "members of Transit got the royal shaft" after the city's merging of the Transit Police with the NYPD, probably doesn't care. He told New York Mag about some artists from his time with the Squad who he actually respected, which include, "Revs; the creative Seen; the talented Ces, Ewok, Cope, and Stem." The powerHouse Arena is located at 37 Main Street in Brooklyn. The conversation between graffiti writers and the cops who busted them will start at 7 p.m. Thursday and is free to all attendees. The event will be moderated by Stern Rockwell of the Streets Are Saying Things online graffiti museum. For more information, visit the powerHouse Arena.